Screencap kindly provided by Yi Feng. We're babysitting each other again? 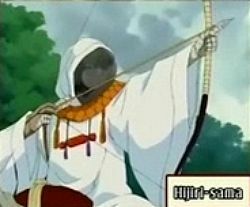 KAG: Naraku's partner, the Princess Abi's demon birds are attacking villages. A mysterious entity was glorified by the people. But that person's true identity is...!